Shults Ford is giving away $5,000 to the person who gives the best Yee Haw during the Yee Haw Contest. That’s right, you read that right. 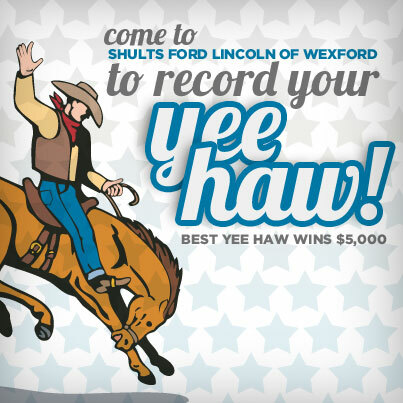 If you come down to Shults Ford of Wexford, record your best Yee Haw, go Shults Ford, YOU can drive away with $5,000. From now until November 19th, Shults Ford of Wexford will be recording videos of customers and fans giving their biggest and best Yee Haw. The videos are then uploaded onto our Facebook page where fans can vote on their favorite. You can cast one vote a day. On November 19th the video with the most votes will drive away with $5,000 from Shults Ford! Yep, it’s that easy! So what are you waiting for? Shults Ford of Wexford is waiting for you to come and give your best Yee Haw. Then, reach out to family and friends and encourage them to vote for your video each and every day. Vote for your favorites today at http://shultsford.pgtb.me/hDg827! Good luck!